Sunday, October 20th, 2013: Michael Marsolek talks with Christopher Hahn, piano professor at the University of Montana's School of Music, about the 2013-2014 Celebrate Piano series, which kicks off October 25th and 26th with the 6th Annual Pianissimo, 7:30pm, Music Recital Hall, School of Music. 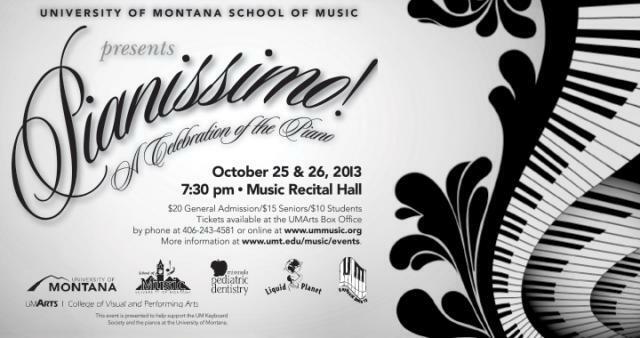 Christopher Hahn on the 6th Annual Pianissimo, Friday and Saturday, October 25th and 26th, 7:30pm, Music Recital Hall, School of Music, University of Montana. Sunday, October 13th, 2013: Michael Marsolek talks with Scott Milner, Director and Program Coordinator for 2 Valleys Stage, the performing arts offshoot of Alpine Artisans, a non-profit arts organization in the Seeley-Swan region. Friday, September 27th, 2013: Michael Marsolek talks with Missoula Symphony Orchestra Music Director, Darko Butorac, and piano soloist, Martina Filjak, about the opening concerts of the 2013-2014 season. "Front Row Center," Sunday, September 22nd, 2013: Michael Marsolek talks with Monica Grable, Executive Director of Hamilton's Bitterroot Performing Arts Council, about their upcoming season of music and dance at the Hamilton Performing Arts Center. Sunday, September 29th, 2013: Michael Marsolek talks with John Zoltek, Music Director of the Flathead Valley's Glacier Symphony & Chorale, about the group's 31st concert season. The 59th Season opens with Governor Steve Bullock narrating the powerful words by and about President Lincoln in Copland’s Lincoln Portrait. This spirit of Americana is coupled with maverick Charles Ives’ Symphony No. 2, complete with gospel tunes, American songs, and barn-dancing fiddles. The season opener culminates with Beethoven’s revolutionary testament in THE groundbreaking and mighty Eroica Symphony. The evening concludes with a dessert reception in the Helena Civic Center Ballroom. The String Orchestra of the Rockies is raising the curtain on its 29th season! It is the only professional ensemble of its kind in Montana and draws upon the talents of the finest string players in the Big Sky Country. Sunday, September 15, 2013—7:30 p.m.